Small tube squeezer lets you utilize every bit of toothpaste, lotion and expensive ointment. Toothpaste tube roller fits 2 1/4" tube width. The toothpaste tube my husband uses is now smooth and rolled up! No more smushes in the MIDDLE of the tube. Wonder why I hadn't bought one 45 years ago! This is great. We don't waste any more tooth paste. Great for all lotions and creams in a tube and toothpaste. Love it for crafting. Wish there was a wider one for larger tubes. 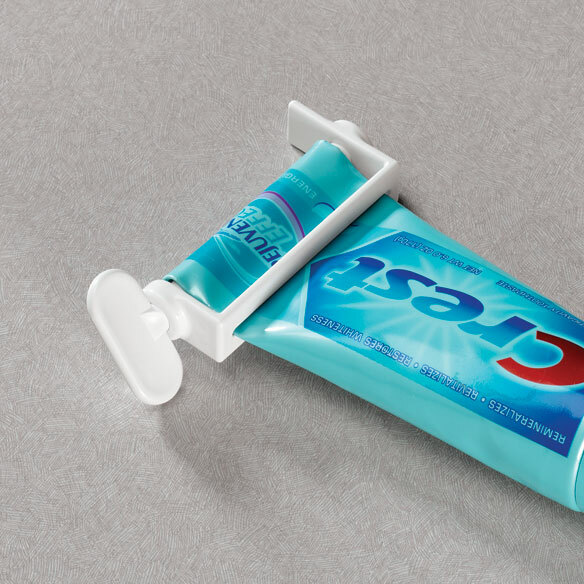 No more struggling to get the last little bit of toothpaste out of the tube! This is the best little invention. Use for all tubes. I use it for anything that is in a tube. It fit my toothpaste tube perfectly and doesn't unravel itself!!! The turn key is perfect for those of use who need it. Uses all the toothpaste to the very end of the tube. Will save money in the long run. Works on other products that come in a tube. I had some concerns about whether the tube squeezer might unwind and not stay in place, but am happy to report it works great. Took me awhile to start the roll. Fingers not as nimble - thing called age. I use this product for toothpaste. This is the third type of product I purchased for this purpose. This is the real deal. It really works to get the product from the entire tube. The only minor issue is sometimes it is hard to start. These are so easy to use and keep any tube ready to use. Hated to keep pushing tubes up with my fingers. going to order more. I always wanted one of these products, but they were too expensive. This was a reasonable price. This has the feature where the roller does not go backwards. It also has the narrowest slot I have seen. I get to use the last bit of toothpaste and nothing goes to waste. I had never used anything like this and it works great. My Mother always used one of these on her toothpaste. Didn't realize until I was older and arthritis started setting in just how handy these little squeezers are. Great product. I had one of these and had been hunting for more because they work so well. I can get every bit of the toothpaste out of the tube! I could never find them in stores and when I saw them in your online cateloge I ordered 2, one for my husband and one for myself. At last, no more wasted toothpaste! Bought 4, should have bought more. I am ordering for the third time. Works slick and gets almost all paste out. Then, if you want to get most product, you can manually squeeze the tube for quite a few more brushes. Some tubes today are made from some type of plastic that does not stay wrapped. Also, many tubes now have a bottom that's too thick or just a smidge long to fit in the revolving part. This squeezer works great on toothpaste and similarly sized tubes. It not only gets the last drop; it neatened up my counter tops. I bought 2, then brought two more. This small size is really pretty big -- too big for small medicinal creams. I use this product for what it is intended for and it works great. Looked for this for years. I use these on my tooth paste tubes, I've looked for this style for years, finally found them. They are so much better than the ones you get in the stores. It was hard for me to get the tube in but once in it works great. It took me a while to get the tube attached, but it does work, even on a large tube. I have been looking for one of these for a long time and finally found it on your site. It makes squeezing the tube so much easier. I just wish it had some time of release when you were done with the toothpaste. this makes using tooth paste a whole lot easier! I put some of these in my husband's & sons socks last Christmas & they liked them so much requested more so ordered a bunch divided up between their Christmas Socks. Per my husband they really do roll up the tubes in such a way to be able to get all the item out. Great little product! My nephew has always wanted a toothpaste squeezer. He's elated! My mother and I are both enjoying our Tube squeesers! Works well and easy to use! The roller worked as expected. It help the tube and paste inside. It did not unroll. It worked well. Easy to use and squeezes tube to empty contents. Ordered size small, however wish it were still a little smaller and less bulky. Use this daily for toothpaste. If I had more, I would use them as well for a variety of "tube-squeezing items. Dependable and easy; been on the market for years in one form or another. Appreciate having; saves time. Something you don't think about, but you're glad you have it!! Makes it very convenient to use tube of toothpaste. Makes getting the paste out of the tube much easier. It does the job once you get it on but is hard to roll. My solution was to not use the rolling element. Gets more out of the tube than my husband would, but not as much as I would!! I really hoped mom could turn these, but she can't and it unrolls on her and jams in the drawer. We'll stick with the flat style, no turning and rolling. A total waste of money. It dos not work as advertised. trying to keep down the cost of toothpaste. We got two large ones already. They work great. Now we're getting two for smaller tubes. Always fight with the tooth past tube. Plastic tubes don't roll . Been looking for something to squeze out all the ointment and roll up the unused portion. Both for the same reason.To get all we can out of the tubes we buy. I'm always trying to get the last drop out of my tubes; the reviews indicate that they perform as represented and expected! it's hard for me to get all the paste out of the tube. needed some small and some large to go with our lifecycle. Got tired of having to re-roll tube each time I used it. I've had them before and they help you get the most out of the tube and are reusable. I needed more of them! It hurts my fingers to squeeze and fold and flatten tubes of cream. This will really help. Got a few for my parents. They were exactly what I was looking for!! Ease of obtaining all of product. My mom bought me one a long time ago and I love it. I wanted to have a spare plus a few for gifts. It's great for OCD people that like their toothpaste to be nice and orderly. This really helps as I have arthiritis in both hands. I am very frugal. "It's good to the last drop". to get the rest out. I want to get every drop out of every tube.